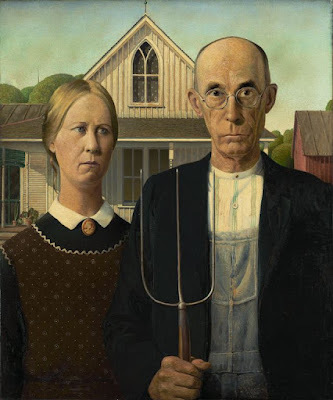 It is one of the most recognized and parodied paintings in the world: American Gothic by Grant Wood. While we are used to seeing the man and his wife on their farm, the strangeness of the title remains: what does American Gothic mean? "Gothic" describes a style of architecture from the High Middle Ages of which the Notre Dame cathedral of Paris is the most famous. 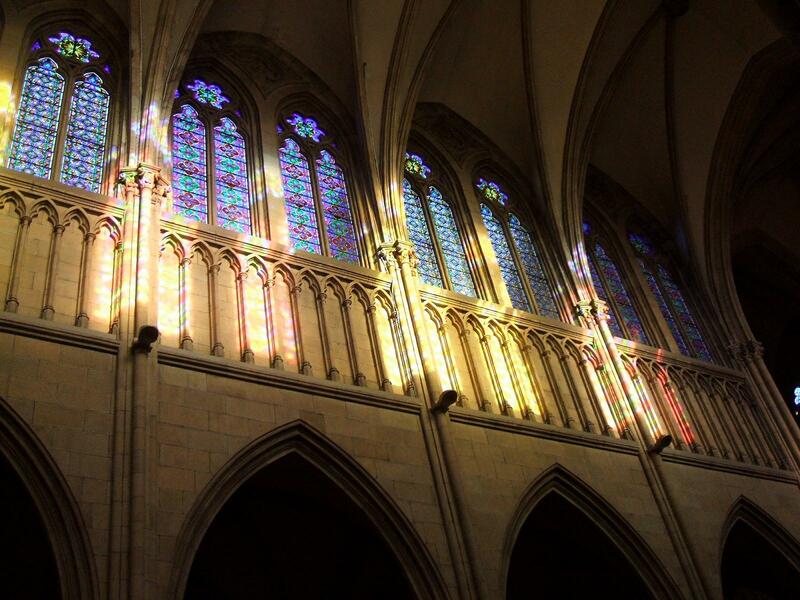 It is a monument to Theology and the spiritual progression of the soul: when you are inside the church, the main level is dark, but when you look up, light fills the upper portion of the church because of the stained glass windows above; spiritually, the "darkness" symbolizes our life on earth, and as we pray and progress spiritually, we are "lifted up above ourselves" to where the windows are (representing reflection that comes from prayer) which allows the Light of God's Grace into our lives and we achieve understanding and wisdom, our darkness is illuminated and we advance spiritually, receiving a small taste of the Joy that awaits us in Heaven. 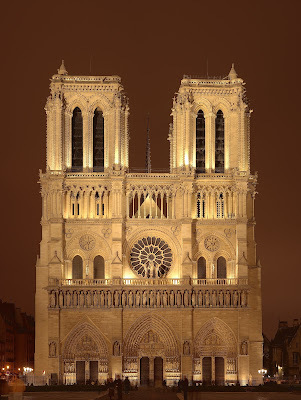 The great size of the cathedral reminds us that our main purpose in life is to serve God and attain Heaven. The clerestory windows of Catedral del Buen Pastor de San Sebastián. Most art historians believe that the "Gothic" in American Gothic refers to the Gothic Revival style of the house behind the man and woman; compared to the grandiose style of Notre Dame, it seems rather anti-climatic so how does Grant Wood tie in the High Middle Ages with Midwest American farmers? You may click on any of the images for closer examination. The man represents "the founding fathers": his dark coat and the white shirt with the "Roman"-styled collar of a preacher (which is echoed by the woman's Pilgrim white collar and black dress) invokes the Pilgrims and Puritans who sought religious freedom. Additionally, his eyes are enlarged by the frames of his glasses which is a standard device in religious art for conveying wisdom. Wood incorporates these references to remind the viewer that originally the privilege of being an American was freedom of worship, not economic prosperity. 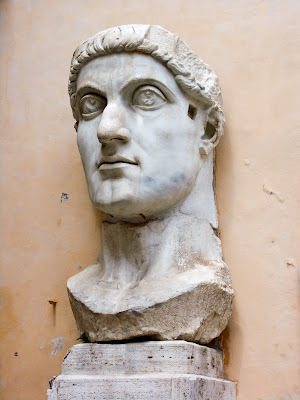 Constantine the Great in marble at the Capitoline Museum. 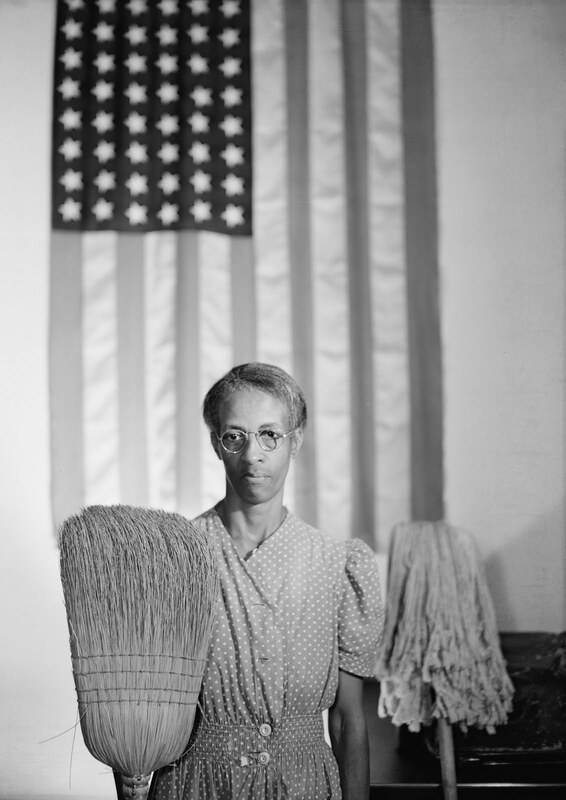 With his pitchfork in hand, he invokes the Protestant work ethic as the grandiose structure upon which American life is based: the Protestant work ethic is rooted in "the Calvinist emphasis on the necessity for hard work as a component of a person's calling and worldly success and as a visible sign or result (not a cause) of personal salvation" (Wikipedia, "Protestant Work Ethic"). This "emphasis" on hard work, Wood seems to be telling us, has now become an end unto itself for Americans and Wood does this in two ways. First, the pitchfork the man holds: of all the instruments and tools that Wood could have chosen, he chose a pitchfork (and he didn't have to chose a tool at all, Wood could have had the man just standing there, or with his arm around his wife). But the pitchfork is important because it suggests that he has "pitched" something: God. emphasizes the importance of Wood having employed the "pitchfork"
in his painting and how a simple "prop" can communicate. Wood seems to be suggesting that, in America and the land of the free, we have freed ourselves of religion and made a theology of work. The hints of the man's outfit that associate him with the Pilgrims, has been incorporated into his daily work routine to justify his work, not to be justified before God. 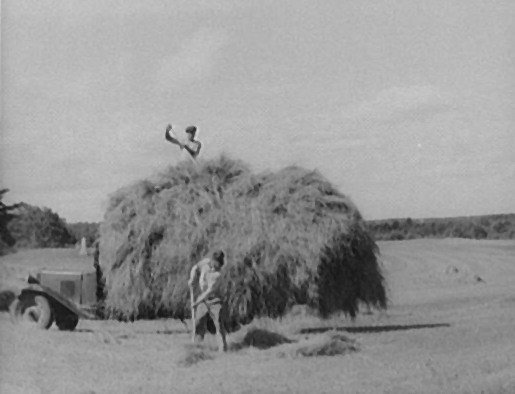 Farmers using pitchforks to move hay. The second way Wood communicates that work has become the primary focus of Americans is by the very distant church in the background. If you look over the tree on the left side of the canvas, just to the side of the woman's head, sticking up far in the background is a small "whisp" above the trees that is a steeple of a church and in this way, the church--and all it represents--is literally "in the background." Whereas in the medieval ages, the church could be seen for miles and was the center of the community, in Wood's American Gothic, the home is the center of the painting because it is the center of American life. that his life would be demanded of him that very night. "which way the wind is blowing." The home replaces church, work replaces God. The farm has become the place of worship and work has become the new religion. None of this seems revolutionary today, but remember, this was done in 1930. If you look above the woman's right shoulder (click on the image and a larger image will open in a new window), a thin strand of her hair hangs out of her tightly wound bun. If she represents America, then America is "coming undone." A woman's apron is her work clothes the way overalls are a man's work clothes. Her brown apron suggests her humility in work but that it's adorned with the pattern and the fringe implies vanity and taking "pride in her humility"; further, the apron covers her Pilgrim style dress, and this is very literal: if the apron represents work and the dress symbolizes the religious freedom the Pilgrims were seeking, then work is covering up religion. If America, in the Roaring 20's, made an idol out of work, then work will be taken away: in 1929, unemployment in America was only around 3%; by 1933, it had jumped to 25%. 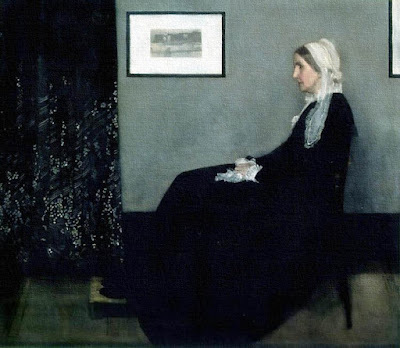 The sour, or bitter, or disappointed or tragic expression on her face--it's difficult to decide what it is--is partially hidden because--unlike the solid gaze of her husband who "views the viewer as the viewer is viewing him," her face is turned, looking off into the distance, perhaps searching for the sign of hope that things are about to improve. But she's not making any move towards the church in the background. 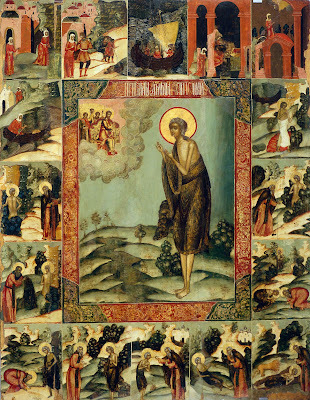 Icon of Saint Mary of Egypt doing the "holy works" of God. Grant Wood's American Gothic then, has become an iconic painting because, like the medieval Icons, this painting depicts two American saints, a husband and his wife, with the sign of the pitchfork, before their place of worship, the hearth and the barn, and communicates a religious truth about Americans: salvation is achieved through work and to work hard is to be a virtuous American. It's not that the Protestant work ethic is bad, but when applied by humans stained by Original Sin, it's obvious that we've turned enslavement into salvation.